A Sony concept for a smart plug and wall socket using its touch-card technology, in which the socket detects the plug and can control its access to electricity. Sony is developing electric wall sockets and plugs that can control power consumption by appliance, user or original power source. 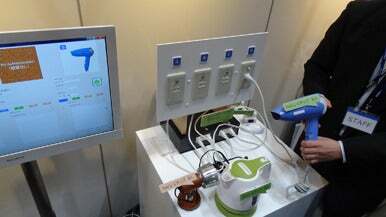 The company showed several demonstrations of its technology Tuesday in Tokyo, including “smart sockets” that only dish out electricity to approved users or devices, and a home power grid that constantly tracks electricity use by time and appliance. Sony has no firm date for when the technology will be released, but hopes to cooperate with appliance makers, power companies, and large infrastructure developers in rolling it out. “These outlets will perform authentication whenever a device is plugged in,” said Taro Tadano, a general manager in Sony’s technology development division. “Power outlets haven’t changed in 50 years,” he said, so creating power networks that are more intelligent than today’s one-way grids is seen as a logical next step as communities worldwide adopt more renewable sources and try to cut down on waste. This is especially true in Japan, which suffered sporadic blackouts after a powerful earthquake and resulting tsunami caused meltdowns at a key nuclear power plant. The country is hoping to rely more on alternative energy sources in the future. Crucial to networks powered by such sources is the ability to track and route units of power across vast electricity grids, which will require that data flows alongside electricity. Sony’s solution is aimed at the final destination of such grids, the outlets where consumers plug in their products. Using Sony's touch-card technology, a smart wall socket detects a hair dryer with an RFID chip and tracks details of its use and power consumption. Sony hopes to employ technology from its touch-card platform, Felica, which uses RFID (radio-frequency identification) technology and is widely used in Japanese trains, mobile phones and credit cards for electronic money. The new system puts the equivalent of Felica “readers” in outlets and equips plugs with the “card” technology, so that the equivalent of a “touch” occurs when a power cord is plugged in and the two sides meet. While the firm says this solution uses proven security technology and existing hardware, it would involve adding adaptors to all outlets in a home to be effective. Sony is also developing a technology that uses a home’s power lines to send and receive the authentication information, so that a single “reader” could serve an entire household. The company said the concept could also be applied to public outlets, for instance those available at airports or for charging electric vehicles. Consumers could “log in” by tapping personal touch cards to the outlets, then be charged by the amount of electricity they use, similar to the way gas stations operate.